Here at The Takeaway, we’re dedicated to bringing you the latest polling news, in a brief, accessible format that doesn’t require you to weed through a lot of text. Every now and again, however, non-polling stories will simply be too good for us to pass up. Today is one of those days. The at-large congressional race in Montana to replace now-Interior Secretary Ryan Zinke was looking a bit too close for comfort; public polling showed a lead for Republican nominee Greg Gianforte of about 10 points over Democratic nominee Rob Quist. Both candidates had issues; Gianforte is a businessman who had just lost a gubernatorial contest, while Quist is a cowboy musician who had regularly performed at nudist camps and had problems paying both his taxes and his contractors. Private polling had a closer race, but most people thought the GOP candidate would win. Then last night news broke that Gianforte allegedly picked up Guardian reporter Ben Jacobs and threw him to the ground. The initial reaction is that this should be the end of the road for Gianforte, who was later charged with misdemeanor assault. But we’d caution against that reaction. It isn’t necessarily wrong — we think it could easily prove correct — but there are a few countervailing considerations to be mindful of. First, this is Montana, and it isn’t clear how an assault on a reporter for a British publication will play there. It may be that people will think, to paraphrase “Sling Blade’s" Karl Childers, “some folks just need body slammin’." (This would certainly be the reaction from some in my home state of Oklahoma.) Second, and perhaps more importantly, Montana opened the early voting window approximately a month ago. It’s estimated that two-thirds of the votes have already been cast. That still leaves a substantial pool of persuadable voters, but they will have to make up for any early voters who might have changed their mind when presented with this information. Regardless, this race was already likely to be closer than the GOP would like. It almost certainly just became at least somewhat closer. Trump Rips NATO: Underpayments Make It Difficult To Confront Vicious “Threat Of Terrorism"
About 600 kilometers north of Peru, an imposing earthen mound looms over the sea. People began building the ceremonial structure, called Huaca Prieta, about 7800 years ago. But according to a new study, the true surprise lies buried deep beneath the 30-meter-tall mound: stone tools, animal bones, and plant remains left behind by some of the earliest known Americans nearly 15,000 years ago. That makes Huaca Prieta one of the oldest archaeological sites in the Americas and suggests that the region’s first migrants may have moved surprisingly slowly down the coast. The crashed European spacecraft Schiaparelli was ill-prepared for its attempt at landing on the surface of Mars.That’s the conclusion of an inquiry into the failure on 16 October 2016.The report outlines failings during the development process and makes several recommendations ahead of an attempt to land a rover on Mars in 2020.That mission will require more testing, improvements to software and more outside oversight of design choices. After three years of construction, the world’s most sensitive dark matter experiment is online, and scientists report that the detector is operating as designed. The XENON1T detector hasn’t found any dark matter particles yet, but it has carried out a 30-day science run, and project scientists are optimistic about the future. The Zika virus probably arrived in the Western Hemisphere from somewhere in the Pacific more than a year before it was detected, a new genetic analysis of the epidemic shows. Researchers also found that as Zika fanned outward from Brazil, it entered neighboring countries and South Florida multiple times without being noticed.Although Zika quietly took root in northeastern Brazil in late 2013 or early 2014, many months passed before Brazilian health authorities received reports of unexplained fever and skin rashes. Zika was finally confirmed as the culprit in April 2015. America’s opioid epidemic is not manufactured hype; it’s real. Prescription painkillers are now more widely used than tobacco. Opioids were to blame for 31,000 overdose deaths in 2015, a 300 percent increase from 1999. Of the top ten drugs involved in overdose deaths, half are prescription opioids. The US Food and Drug Administration (FDA) has issued its first approval of a cancer drug that targets tumours with specific mutations, regardless of where in the body the tumour first took root.This deviates from the agency’s previous approach: although a drug’s use may have been linked to the presence of a particular molecular marker, the FDA still required individual approvals for that drug based on the tumour’s location.The new approval, announced on 23 May, expands the use of a drug called pembrolizumab, manufactured by pharmaceutical giant Merck & Co. of Kenilworth, New Jersey. A Whale of a Tale: How Did They Get so Big? Whales are the largest animals on the planet, but they haven’t always been giants. Fossil records show that ancient whales were much smaller than the currently living behemoths.So when did whales get so big, and how?A new study suggests it might be due to changes in climate that affected the food that some whales eat: krill and small fish. Instead of being spread throughout the ocean, lots of krill started being packed into a small area. Bigger whales were simply more efficient at eating the dense pockets of krill, and they beat out their smaller cousins. Tedros Adhanom Ghebreyesus of Ethiopia was voted director general of the World Health Organization on Tuesday, the first African ever to head the agency.The election was the first conducted by the W.H.O. under more open and democratic rules. After nearly two years of public campaigning, originally by six candidates, the voting took place in a closed-door session in which the health ministers of 186 countries cast their ballots in secret. Copyright © 2017 CBS Interactive Inc. All rights reserved. The email address for this newsletter is wealthcycles2013.mail06@blogger.com. Good morning, it’s May 25, 2017. This morning at RealClearEducation we have news, commentary, analysis and reports from the top of the education world. Secretary DeVos appeared before a House Appropriations subcommittee yesterday and was grilled by Democrats over the administration’s proposed budget cuts and federal expansion of school choice. In perhaps the most important exchange of the hearing, Rep. Katherine Clark, D-Mass., asked DeVos whether she would prevent private schools that receive public dollars from discriminating against students. Citing an example of a private Christian school in Indiana that denies access to gay students, Clark pressed DeVos on how she would treat that school if it applied for federal voucher funds. DeVos countered that it would be up to the states to decide. However, when Clark posed a hypothetical about black students, DeVos said that the Office for Civil Rights would step in. The exchange highlights a problem that supporters of school choice have debated for years – can public dollars flow to private schools without subjecting those schools to federal laws and regulations? This question is the reason that many conservatives have argued against a federal expansion of school choice. Yesterday’s exchange between Clark and DeVos will no doubt highlight their concerns even more. The hearing also contained an important exchange between DeVos and Rep. Martha Roby about Common Core and federal intrusion into standards and curriculum. DeVos agreed with Roby that ESSA prevents the federal government from dictating or influencing state standards and she said the department would follow the letter of the law. As Politico reports, the head of the Education Department’s student financial aid office resigned late Tuesday night. In a memo explaining his decision, James Runcie, chief operating officer of the Office of Federal Student Aid, stated that he was “encumbered from exercising [his] authorities to properly lead this great organization." He had also been ordered by DeVos to testify before the House Oversight Committee and refused, which also factored into his resignation. 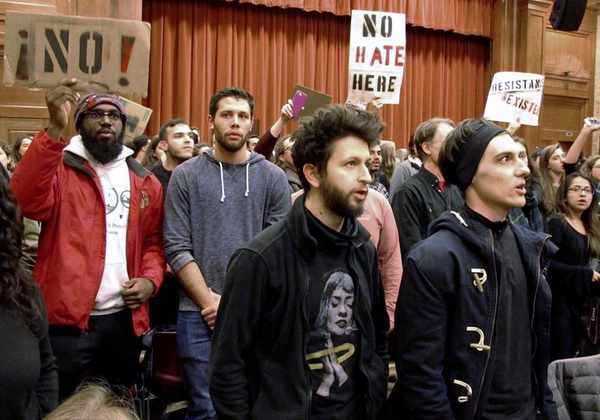 More than 60 Middlebury College students have finally been disciplined for their roles in the protest of Charles Murray and injury of a Middlebury professor. However, none of the students were suspended or expelled. Instead, the college said the punishments range “from probation to official college discipline, which places a permanent record in the student’s file." Below are more highlights of the content already on our site this morning. To see everything we have, visit RealClearEducation.com. NEWSMAKERS: Dozens of Middlebury College students are finally disciplined for their roles in the protest of Charles Murray and injury of a Middlebury professor. 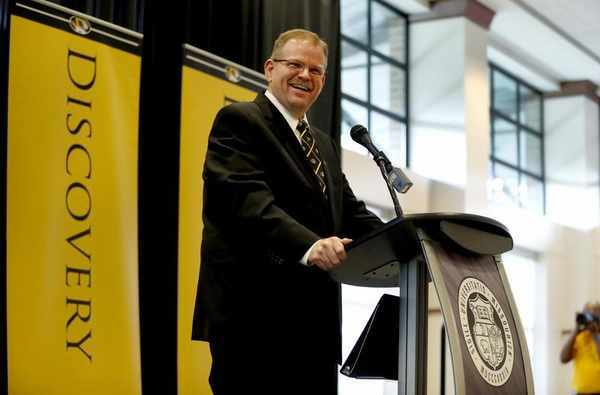 IN THE STATES: Following protests and a drop in enrollment, the University of Missouri names a new chancellor. Will OPEC Extend Output Cuts in Bid to Push Up Oil Prices? Energy ministers from Opec, the oil exporters’ group, are meeting at their headquarters in Vienna to do something about it.They will be joined by delegates from some oil suppliers outside the group.On the agenda: whether to extend the oil production curbs agreed last year that are due to expire next month. Should OPEC Worry About Contango and Backwardation? “Backwardation is the solution" to OPEC’s problem of how to raise output and revenues without sparking another shale boom, according to the influential oil research team at Goldman Sachs.Backwardation would allow low-cost oil producers in OPEC to sell their output at a higher price linked to the spot market while curbing growth from shale firms that sell at prices linked to the forward curve.Goldman’s strategy aims to “share growth" between OPEC and shale firms to avoid another repeat of boom and bust in oil prices (“Backwardation is the solution", Goldman Sachs, May 22). OPEC member states and Russia will meet in Vienna Thursday, where they are expected to agree on continuing oil production cuts for another nine months.The petro states are seeking to keep crude oil prices from sliding below $50 a barrel. OPEC, Russia and 10 other non-member states agreed to reduce output by 1.8 million barrels per day in the first half of 2017.OPEC’s Thursday meeting, however, highlights the fundamental shift occurring in the global oil industry. The promise of a battery that powers your home is that you can sock away energy for a rainy day as easily as putting money in a savings account.Around the world, more homeowners are experimenting with residential batteries, which grab energy when it is generated and store it for later use. The excess power can be tapped if the grid goes downin a storm, sayor during high-demand periods when electricity is more expensive. President Trump’s budget proposal for 2018 envisions a flurry of changes to domestic energy policy, reaping billions of dollars in one-time revenue from oil and gas resources while cutting research into future energy technologies that could pay long-term dividends.Mr. Trump’s budget, released Tuesday, says it will raise about $36 billion over the next 10 years by selling off major American energy resources and infrastructure, opening up vast new areas of public land for oil and gas drilling, and redirecting state revenues from oil and gas royalties back to Washington. Over the past decade, the public perception of electric cars has shifted dramatically: Surveys show that teens love Tesla, the Chevrolet Bolt was named car of the year, and in Shanghai, China, a plug-in hybrid Cadillac is winning over millennials. How did we get here?As more electric vehicles are taking off around the world especially in places like Oslo, where they have become very popular people are coming to realize that they’re not just a passing fad but something credible for the future, Naomi King, a postdoctoral researcher at Oxford Brookes University, tells Inverse. So it turns out global warming isn’t that bad after all.That’s exactly the conclusion Justin Ritchie doesn’t want the world to draw from the paper he just published.And for a good reason. It’s wrong.Ritchie, a Ph.D. candidate in resources and the environment at the University of British Columbia, was working as a teaching assistant in 2013 and trying to come up with assignments for his students. Looking through “business as usual" and worst-case scenarios for the emission of carbon dioxide into the atmosphere, he saw that reliance on coal for energy started ramping up around 2040. It’s all but decided that the Organization of Petroleum Exporting Countries and Russia will extend their so-called “production cuts" at Thursday’s meeting in Vienna. It’s clear, however, that the play has been a mistake for Saudi Arabia, which initiated it. It should have stuck with the policies of its former oil minister, wise Ali Al-Naimi, who had driven down the price of oil in 2014 and put the U.S. shale industry through the wringer. Watch RealClearPolitics’s From Heartland to Homeland: The Energy Renaissance on Livestream.com. The glut of cheap natural gas from a single, gigantic, shale basin that straddles the Northeast, mid-Atlantic and Midwest has sparked a massive construction boom of power plants. Dozens have been built in the past two years alone.There’s just one problem: There isn’t nearly enough electricity demand to support all the new capacity. And as wholesale electricity prices plunge, industry experts are anticipating a fire sale of scores of plants in the region. 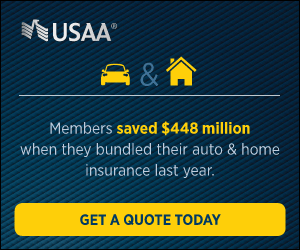 Presented by USAA MORNING RECON: Is the U.S. Navy Dying? ; Closing the Civilian Awareness Gap; New Threats for Missile Defense; A-10 “Elephant Walk"
Good Thursday morning and welcome to MORNING RECON. On this day in 1944, American forces invade and take control of the Marshall Islands, long occupied by the Japanese and used by them as a base for military operations. Also, General George C. Marshall, in a memorandum to President Roosevelt dated February 3, 1944, wrote: ‘The fact that the ground troops, Infantry in particular, lead miserable lives of extreme discomfort and are the ones who must close in personal combat with the enemy, makes the maintenance of their morale of great importance. By Mackenzie Eaglen, The National Interest “President Trump’s first defense budget is a more muscular version of former president Obama’s plans. It is a budget that begins to repair—but does not rebuild—the U.S. military." By Aaron Mehta, Defense News: “U.S. Secretary of Defense Jim Mattis personally intervened to increase the number of munitions being bought in the Pentagon’s fiscal 2018 budget request, pushing procurement of six specific weapons to the maximum production rate industry can handle, a top Defense Department official said Tuesday." By Irene Klotz, Reuters: “The U.S. Defense Advanced Research Projects Agency on Wednesday said it will invest up to $146 million in an alliance with Boeing to build an experimental spaceplane that can deliver small satellites into orbit on a daily basis." By Christopher P. Cavas, Defense News: “Lockheed Martin, frustrated by changing requirements the company feels are skewed to a particular competitor, is dropping out of the U.S. Navy’s over-the-horizon missile program intended to give a lethal capability to littoral combat ships and frigates." By Megan Eckstein, USNI News: “The Navy plans to buy a second Virginia-class attack submarine in Fiscal Year 2021 to keep the industrial base building two SSNs a year even during Columbia-class ballistic-missile submarine procurement, several Navy officials confirmed today." U.S. Air Force: 30 A-10 Warthog “Elephant Walk"
By Kyle Mizokami, Popular Mechanics: “The U.S. Air Force just staged an “elephant walk" of A-10 Thunderbolt ground attack jets as a show of force. The May 22 exercise took place at Moody Air Force Base, Georgia. In a statement on Facebook, the base stated the exercise “was conducted in order to demonstrate the wing’s ability to rapidly deploy combat ready forces across the globe."" By Idrees Ali & Phil Stewart, Reuters: “A U.S. Navy warship sailed within 12 nautical miles of an artificial island built up by China in the South China Sea, U.S. officials said on Wednesday, the first such challenge to Beijing in the strategic waterway since U.S. President Donald Trump took office." By Kathy Roth-Douquet, RealClearDefense: “Our military, which deploys around the world to protect our nation, is an all-volunteer force. Those who choose to serve on our behalf willingly make the deep sacrifices that military service requires. For those who have not served in the military or been part of a family with an active duty service member, it can be hard to visualize just how difficult military family life can be." By Dan Caldwell, RealClearDefense: “Every Soldier, Sailor, Marine, and Airman knows that being overweight and out of shape hampers performance. In the same way, the bloated budget and wasteful inefficiencies at the Department of Defense (DoD) make our fighting force less effective. A good opportunity to trim that fat is through base realignment and closure (BRAC)." By Mead Treadwell, RealClearDefense: “As North Korea works furiously to advance its nuclear missile arsenal to threaten our homeland, an upgrade of America’s missile defense systems could not come at a more crucial time." By Ash Carter, Harvard Business Review: “When Army 2nd Lieutenant Joseph Riley was a senior at the University of Virginia, he ranked 10th out of 5,579 in the Reserve Officers’ Training Corps (ROTC) National Order of Merit List. Upon graduation, he was proudly commissioned an Army officer and selected as a Rhodes Scholar to study at Oxford, where he pursued a master’s degree in international relations. That was where the trouble began." Is the U.S. Navy Dying? By Dave Majumdar, The National Interest: “The United States Navy is in a dire situation when it comes to the readiness of its aircraft, ships and submarines. The blame for the situation can be laid directly at the feet of the U.S. Congress, which has failed time and again to pass a budget." By Sean Dorney, Lowy Interpreter: “‘Beyond the Legend’ is a good sub-title for this absorbing collection of contributions from an impressive array of former soldiers, military historians, academics and others from Australia, the US and Japan, brought together for an international conference at the Australian War Memorial in 2012 to mark the 70th anniversary of the Kokoda campaign." By Artur Varanda, Strategy Bridge: “"Things have come down to the Triarii." This is an old Roman saying, meaning that the situation has come to its bitter end. When the legions were essentially made of conscripted citizens, the Triarii were the oldest and wealthiest soldiers, and in battle they stood behind the lighter and younger Hastati and Principes. Usually, the Hastati were employed first, followed by the older and wealthier Principes, which usually were enough to win the battle. Having to commit the Triarii—the oldest, most influential citizens—into the mêlée meant that the situation was dire, and that victory was to be attained at all costs." By David Jennen & Charles Barham, Small Wars Journal: “Transnational Organized Crime. TCOs threaten the United States for two principle reasons. First, TOC networks threaten U.S. national interests. TOC, like TTOs, find it easy to develop and mature in unstable countries or failed states with weak rule of law. They penetrate both government institutions and licit businesses where they increase corruption and contribute to increased instability. TOC has become increasingly complex and significantly threatens U.S. and international security by expanding their reach into areas that present a threat to public safety, public health, governmental institutions, and economic stability." By Sara Bjerg Moller, War on the Rocks: “Although not officially a summit (the last NATO summit took place in Warsaw in 2016 and the next one won’t be until 2018), today’s meeting of NATO leaders comes at an important moment in the alliance’s evolution. Usually staid affairs, this gathering of leaders from all 28 NATO member countries promises to be anything but." By Seth Johnston, Modern War Institute: “Nearly every aspect of NATO—from its missions to its membership—is strikingly different than at the Alliance’s founding in 1949." By Jordan Becker, War on the Rocks: “Transatlantic burden-sharing is atop the agenda for this month’s meeting of NATO leaders – President Trump’s first trip to confer with heads of state and government from the entire alliance. And for good reason." By Will Edwards, The Cipher Brief: “South Korea and Japan are attempting to maintain business as usual in their alliances with the U.S., but the Trump Administration has not made this easy. A gap between President Donald Trump’s unpredictable comments and the more measured statements of his top Cabinet members has made building relations difficult." By Brahma Chellaney, The Strategist (ASPI): “Chinese President Xi Jinping’s tenure has been marked by high ambition. His vision—the ‘Chinese dream’—is to make China the world’s leading power by 2049, the centenary of communist rule. But Xi may be biting off more than he can chew."